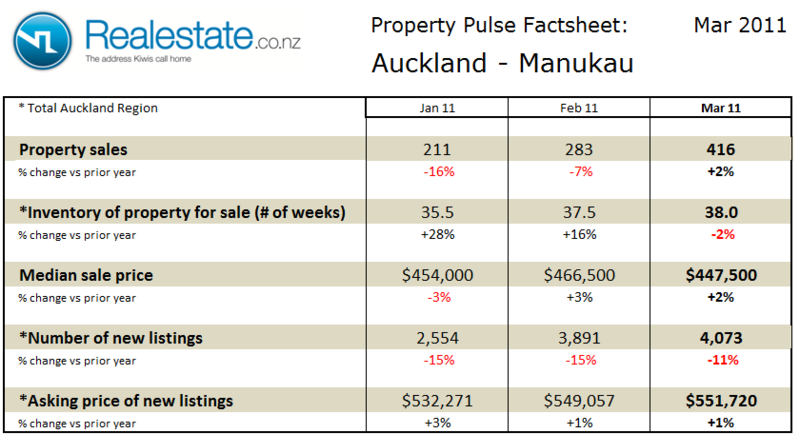 The Auckland – Manukau property pulse factsheet for March 2011 is published using data from Realestate.co.nz and REINZ (Real Estate Institute of NZ). Property sales at 416 in the month rose on a seasonally adjusted basis in March and were up just 2% on March 2010. The inventory of unsold houses across the wider Auckland region remains just above the long-term average at 38 weeks of equivalent sales. The median sales at $447,500 was up 2% as compared to a year ago, but recorded a fall from the prior month. The asking price expectation of new listings across the wider Auckland region is up just 1% as compared to a year ago at $551,720. The Auckland region Property Market factsheet for October 2010 can be downloaded by clicking this icon. Property prices based on the stratified pricing model rebounded in September to $487,800. Compared to Sep 2009 the stratified price is up 2.3%. The current price is still 4% below the peak of the market in July 2007 a full 3 years ago. Property sales increased in September by 7.8% on a seasonally adjusted basis. There were 1,655 sales in September compared to 2,299 in September 2009. On a moving annual total basis sales are down 3.4% at 20,374. Inventory of houses on the market rose slightly in September. There were 37 weeks of equivalent sales which continues to exceed the long term average in the region of 32 weeks. In overall terms the property market across Auckland continues to be steady, with certainly a more robust level of activity compared to other regions of the country, this is matched to some strengthening in prices. The Auckland region Property Market factsheet for August 2010 can be downloaded by clicking this icon. Property prices based on the stratified pricing model slipped sideways in July to $470,266. Compared to June 2009 the stratified price is up 1.7%. The current price is still 8% below the peak of the market in July 2007 – a full 3 years ago. Property sales slipped further in July down 3.0% on a seasonally adjusted basis. There were 1,486 sales in July compared to 1,977 in July 2009. On a moving annual total basis sales are up 10.5% at 21,551. Inventory of houses on the market rose in July. The July figure of 37 weeks of equivalent sales continues to exceed the long term average in the region of 32 weeks. In overall terms the property market across Auckland continues to be steady, certainly a more robust level of activity compared to other regions of the country, although prices are weak. The Auckland region Property Market factsheet for July 2010 can be downloaded by clicking this icon. Property sales also slipped in June down 6.7% on a seasonally adjusted basis. There were 1,599 sales in June compared to 1,990 in June 2009. In the first 6 months of 2010 total sales are down 8% from 10,879 in 2009 to 10,005 this year. Inventory of houses on the market fell again in June. The June figure of 35 weeks of equivalent sales is now only slightly ahead of the long term average in the region of 32 weeks. Property prices based on the stratified pricing model remained stable in May at $481,225 – this level has been consistent around the $480,000 mark for most of this year. Compared to 2009 prices are up 3.7%. Property sales remained flat on a seasonally adjusted basis with 1,664 in May as compared to 1,665 in April. Sales for the first 5 months of 2010 reflect a 5% lower level than the same period on 2009. Inventory of houses on the market fell slightly in May from the April peak of 41 weeks of sale to 38 weeks, this continues to be slightly ahead of the long term average in the region of 32 weeks. In overall terms the property market across Auckland continues to be steady, certainly a more robust level of activity compared to other regions of the country. 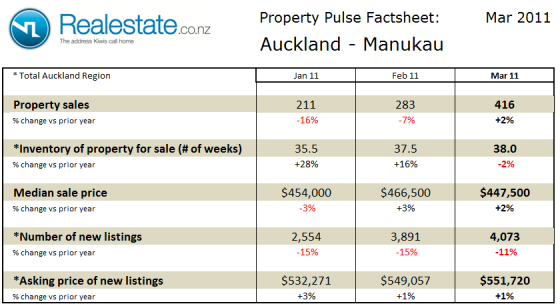 The Auckland region – Property market pulse factsheet for June 2010 is available as a download pdf document.